Description : Combines exceptional elegance with durability to keep exteriors looking ever new. 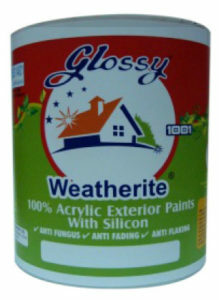 As a water-based high-build 100% acrylic emulsion, it has unmatched anti-fungal, anti-flaking and anti-fading properties. Hair-line cracks are easily bridged because of its superior adhesion and plasticity. Growth of fungi and algae is curbed, and the blackening they cause in other exterior finishes prevented, by its broad spectrum biocides and fungicides. Besides, its unique one-way barrier - a special osmotic quality of the paint film - allows it to breathe out moisture without absorbing any - thus protecting the brickwork and concrete. Cement, sand surfaces, brickwork, rough cast concrete blocks, fibre boards and cement paint coated surfaces. 12 to 13 sq. metres per litre per coat depending on the surface and shade. Dry for a minimum of 4 hours between coats. 1, 4, 10 & 20 litres. Normally no primer is required. On highly absorbent or chalky surfaces, apply a coat of Weathercoat Smooth thinned with water (1:1 by volume) as a self priming coat to reduce surface porosity. Cementous, asbestos & brickwork etc.